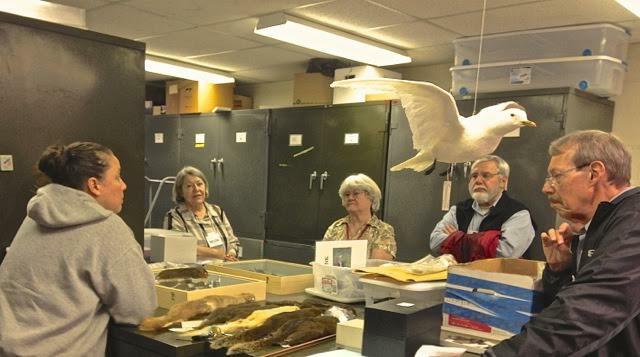 An enthusiastic class from OLLI (Osher Lifelong Learning Institute at UGA) spent a happy Monday afternoon touring the Georgia Museum of Natural History. Director Bud Freeman met with the group for orientation and a question-answer session. Curators offered one-on-one sessions in Museum Laboratories. Betsy Reitz explained Zooarchaeology; Nikki Castleberry, vertebrates; and Rick Hoebeke offered a tour of the arthropod collections. This event was an OLLI class offering and is scheduled to be repeated next year. President Dac Crossley made certain that all were invited to membership in the Friends of the Museum. Would your group like a tour of the Natural History Museum? Contact Kim Leissner at (706) 542-1663 to initiate a request. Nikki Castleberry explains the bats of Georgia. But watch out for that seagull! Our seasonal party will feature “Rare and Unusual Birds of Georgia,” with new additions to the collections. We’ll celebrate another banner year at the Museum with snacks and seasonal beverages. It will be held in the Museum gallery, December 10, 6-8 p.m.
Don’t forget to sign up! E-mail Dac Crossley (soilmite@earthlink.net) right away!